O boiling, bubbling, berry bean! The breath of morn, the perfumed meal. Our search takes us to the Cerro Punta where Luis Miguel has a little finca and cultivates a few hundred coffee plants. Coffee comes from the Latin form of the genus Coffee, a member of the ubiaceae family which includes more than 500 genera and 6,000 species of tropical trees and shrubs. Other members of the family include the gardenias and plants which yield quinine and other useful substances, but Coffee is by far the most important member of the familyeconomically. "I bet you didnt know that did you?" says, Luis Miguel Ramos Carvajal. I said, "Luis no....but save us the history lesson. We are on a quest of the Holy Grail of the Coffee Kingdom, the best coffee in the world. "Well, take a look around.... isnt the view out of sight? And those arent tomato plants." "Yes, Louis now lets talk about the Cafe...Okay?" "Si, my friend. I will first show you. Then well have a cup of coffee and those delicious finger licking good yummy-yummy world famous Diablo Clubhouse Empanadas. Joe, honest I got the recipe when the Panama Canal Company pulled out and it became El Rey Supermercado. But that is another little story...Ill have to tell you some day." The coffee plants range from small shrubs to trees as tall as 32 feet high and the leaves can range in color from purple to yellow, however, green is the predominant color. Coffee is a tropical plant. 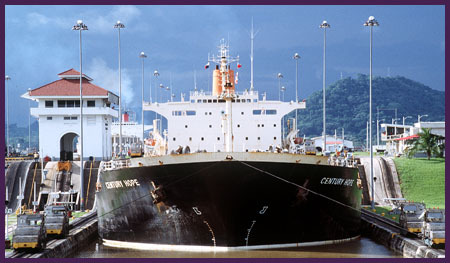 It is ideally suited for the roughed Colombian mountains and here...in this lost paradise of the universe called Chiriqui. All coffee plants need good drainage. Frost is the worst climatic event that can affect a coffee plant. The coffee plants bear fruit in lines or clusters along their branches. The fruit turns red and cherry-like when it is ready to be harvested. Depending on the type of coffee plant, the cherry takes between 6 to 11 months to ripen. A growers secret is to grow coffee trees in close proximity to each other. This is the traditional way that produces the best coffee plants. Another big surprise to some first time Coffee growers is never and I mean never use manure or chemical fertilizer on your plants. "I dont have to tell you Joe, what this can do to a great cup of coffee!" "Okay, Luis cut to the chase...lets get to the good stuff, so we can enjoy the best coffee in the world." "Joe, you got it. Here we grow Arabica coffee. It is has an advantage over the other major species the Robusta, in that it is capable of fertilizing itself. Robust cannot. Aribica represents approximately 70 percent of the worlds coffee production." As you can see the Arabica plant is an evergreen, typically large bush with dark green, oval shaped leaves that can reach a height of 14 to 20 feet fully grown. Here on this small Hacienda San Antonio, we keep the plants at a height of about two to three metros to facilitate harvesting and nourish heavy bearing of berries. These plants here were planted three years ago and have now reached maturity. That is when they produce first crop. Although the Arabica plant can produce fruit for about 50 years, the fruit yield decreases significantly after 30 years. A seasonal climate of 60 to 75 degrees Fahrenheit encourages the Arabica trees to flourish and produce ideal beans. They also require an annual rainfall of 60 inches to be happy. Each tree you see here has produced between 1 and 12 pounds of coffee a year. Coffee Robusta is our competition. Robusta grows up to 32 feet in height as a shrub with a very shallow root system. The fruits are round and take nearly a year to mature. Another key difference is that the seeds are rounder and smaller than Arabica beans. It represents 25% of the world's coffee production. Robusta trees produce their first crop 3 to 4 years after planting and they remain fruitful for 20 to 30 years. The coffee trees flourish in equatorial conditions with temperatures around 75 and 85 degrees Fahrenheit and an annual rainfall of 60 inches. Robusta tends to be a hardier, more disease-resistant bean than Arabica, which is less expensive to maintain and produces a higher yield. Consequently Robusta beans are used for the less expensive canned and instant coffees you find in most supermarkets around the world. This is definitely not your best choice for a cup of coffee that is out of this world. Arabica coffee grows best at high altitudes (from 1500m to 2500m) while Robusta coffee prospers in lowlands such as rainforests. Before roasting the beans, the colors of Robusta beans are yellow to light brown in appearance; whereas, Arabica are green with silver/bluish shades. The Robusta is round while the Aribica bean is flat and oval. Another interesting fact is that Robusta beans have more caffeine content then the Aribica beans. On the average .8% more, so if you are into jumping-jumping then the Robusta beans are for you. But we here love Arabica beans. This is the bean that produces the fabulous Cafe Duran. I have some 100 LB sacks in the shed but lets go and enjoy some fabulous coffee. A perfect cup of coffee is easy if you start by simply combining ground beans with water until the brew is drinkable. Sounds easy, but as very coffee drinker knows it can be a disaster when not done right and it can definitely ruin your Manana. Yes, Mon.! There are three rules that one must not break or you get ca-ca! In order to consistently making a great cup of coffee, you must start with the best coffee beans in the world, a spotless clean machine and delicious sparkling clear cool water. In Panama this is not a problem. The water of the Chagres is the best in the world. Here at the Hacienda San Antonio we use only sparkling cool mountain stream water. Now, lets elaborate a bit. Make sure that the equipment you are using is thoroughly cleaned. Leftover residue, oils and grounds will leave strange flavors in your brew. Ideally, you should clean your coffee maker thoroughly at least once a week with a mixture of water and vinegar to remove the oils. We here use a Mr. Coffee Drip Coffee Maker. Surprise? Dont be. Mr. Coffeebrews delicious cup of coffee every time. Remember to buy and start with fresh, quality coffee beans. 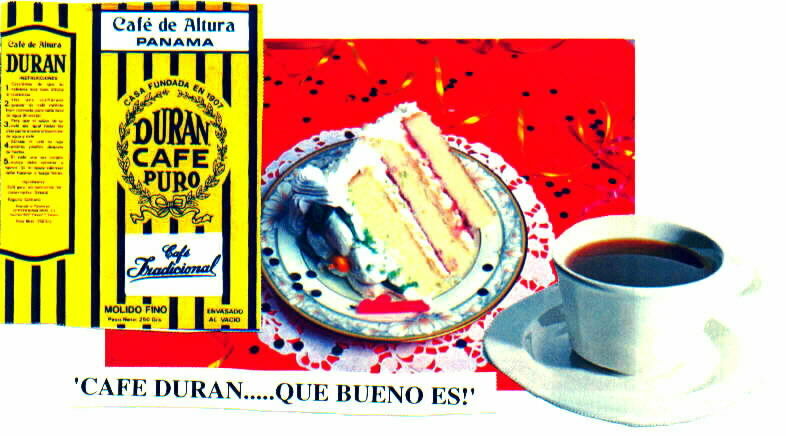 We here love Duran Cafe Puro. Their farm is a few miles away. This Coffee House has been around since 1907. Now I would tell you that Teddy Roosevelt had something to do with this... but I wont. I will say that Teddy really knew how to build a canal and he knew his coffee. He would consume gallons of coffee a day. From the very first cup while at the Tivoli Guest House, Teddy Roosevelt loved the taste of Cafe Duran! Now if I recall he also had quite a few cups in an all night poker game with John Stevens, Doctor Gorgas, Presidente Amador Guerro, and Col. Tom Murphy of the local Marine Barracks. Well, lets get back to brewing the best cup of coffee. Remember to protect your beans. If your beans get stale it will produce a very flat awful tasting beverage. Now, 98% of a cup of coffee is water. Bad water means bad coffee. Use fresh, clear water to prepare your coffee. In order to brew an outstanding cup of coffee, always, grind your coffee beans just minutes before brewing. This will give a fresh taste and avoid bitter or stale flavors in the coffee. If you cant do that then buy Duran Cafe en los sobrecitos. You use only what you need and save the rest for the next coffee break. Now, this is very important. So listen up...make sure that the grind of the coffee that you are using matches your method and taste. We here like very fine grind. Also only use the right amount of coffee. The most common mistake is not using enough coffee. The result is another bad cup of coffee. That can be best described as very thin and watery like dirty dishwater. It also lacks thedepth of flavor that a great cup of coffee will produce and have people yelling, "Now that is great Coffee!" Here is a good rule of thumb: 2 level tablespoons for each 6oz cup of coffee. And never, never boil your water. If you do the delicate flavors of the Coffee will be lost forever. You should instead brew "just off the boil", between 195 to 200 degrees Fahrenheit (95-98°C). Mr. Coffee is famous for having this perfect brewing cycle. Another little inside secret is to warm your cup before pouring the coffee in; this keeps the coffee hot longer. Hey, I bet you didnt know that did you. And always stir the coffee before serving. This will produce good consistency in the heavier oils in the coffee. Now, here is another common mistake that people make and then they wonder why their coffee has gone down hill fast after their first great cup of coffee. The cardinal rule after brewing a great cup of coffee is to never leave it on the warmer plate or stove. After 20 minutes the coffee will taste dull and stale and it will develop a bitter, acrid flavor. Not a good cup of coffee. It is better to put it in a quality thermos and serve from there. Just like the coffee carafes that were provided at the Tivoli Guest House in the Breakfast room. And most important, always drink your coffee freshly brewed. Never reheat coffee. If you follow these simple rules you will always have a great cup of coffee! Luis, what is that fragrance I smell emitting from your country-style Kitchen? "That my friend is the best coffee in the world!" So, lets all enjoy a cup of Cafe Duran with some delicious Diablo Clubhouse Empanadas that Rosita as prepared for us. Yes, indeed life is good! Blend until smooth, but don't over blend. Serve in a nice tall glass. Gently heat all of the ingredients except for the coffee in a chafing dish or, if one is not available, you can use a saucepan. Pour the hot coffee into a coffee mug. After a few minutes, the brandy should release its unmistakable aroma. At this point ignite the brandy and allow the flames to burn for 15-20 seconds, then ladle the brandy mixture over the hot coffee. Mix the coffee and brandy together. Cafe Duran, que bueno es! El Cafe que mas gente pide por nombre. 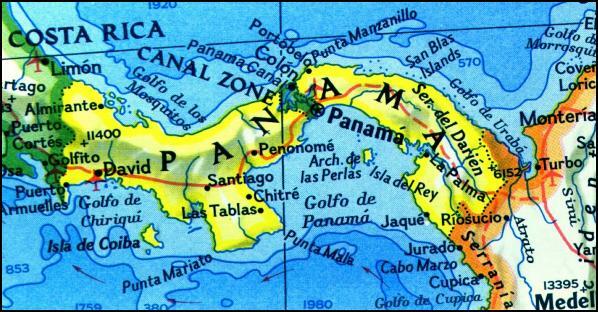 Panama the land divided the world united.